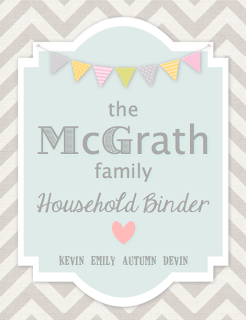 For those of you creating a Household Binder for your family, here are your free printables of the week! Bake chicken for 20 minutes, baste with juices from the bottom of the baking dish, bake for 20 minutes longer for a total of 40 minutes. Place asparagus in the oven and cook for 10 minutes or until tender. In a medium pan, place tomatoes, olive oil and balsamic vinegar and cook on medium heat until the tomatoes become soft. 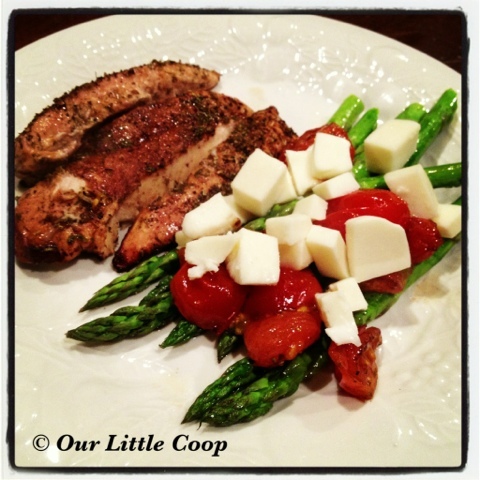 Place chicken and asparagus on plate, top asparagus with tomatoes and mozzarella cheese and drizzle extra balsamic over top and enjoy! Make sure you head over to http://www.fromscratchmag.com to sign up for updates and your free subscription! Well winter is here in full force and luckily our girls are all still laying very well. We have been taking all steps necessary to ensure they stay healthy and happy, and in turn, they have continued to provide us with the same great tasting eggs. 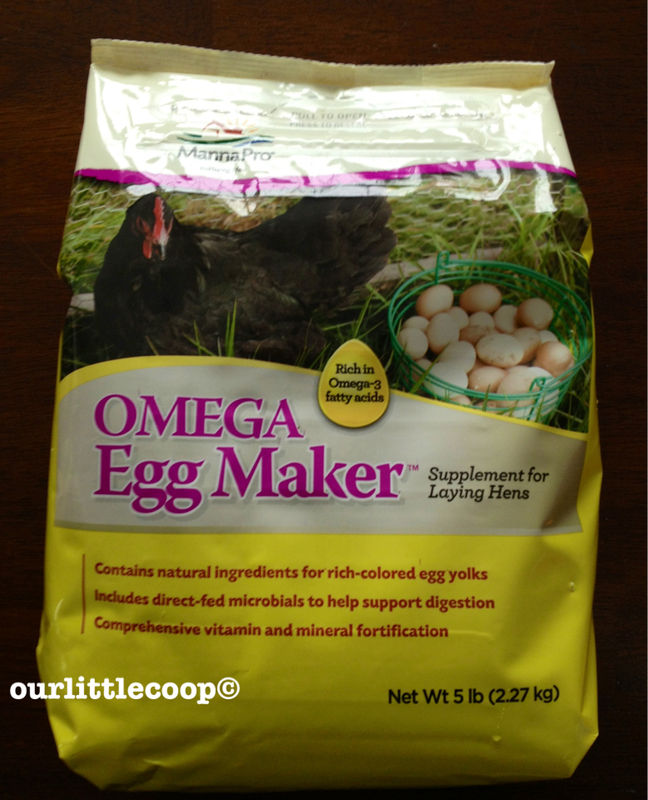 "There is nothing better than fresh eggs!" 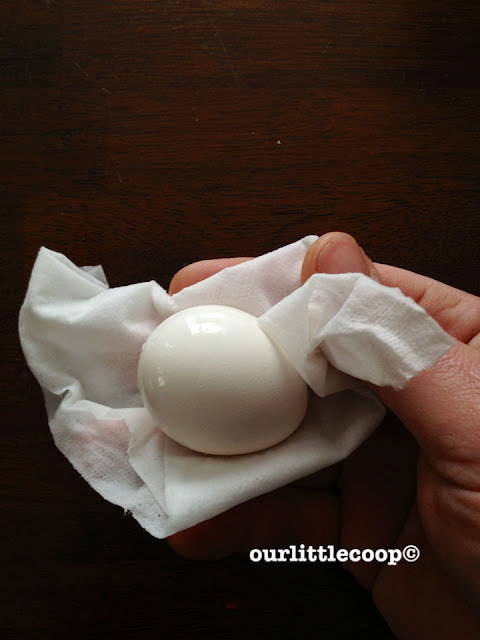 as Manna Pro states on their containers of Wipe 'N Wash egg cleaning towels, and how can anyone disagree!? 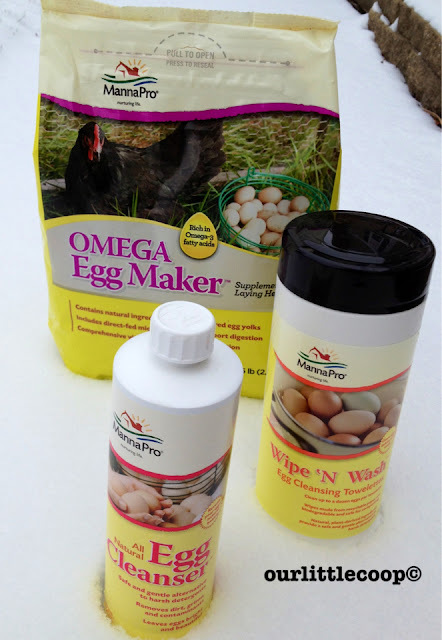 Manna Pro has been dedicated to providing some of the best products for backyard flocks since 1985. They understand most of us are committed to a more sustainable lifestyle, and continue to produce their products with as little strain on the environment as possible. Recently they had sent Our Little Coop a bunch of products to sample and giveaway to our readers. We are always very thankful for that! 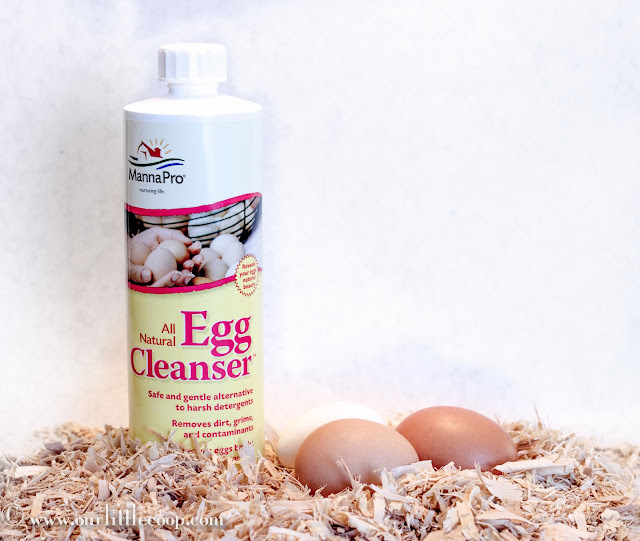 The All Natural Egg Cleanser is one of the best alternatives to harsh detergents currently on the market and is very simple to use. Place your eggs in a large bowl, cover with approximately 1 gallon of warm water and add about 2 capfuls of the Egg Cleanser. 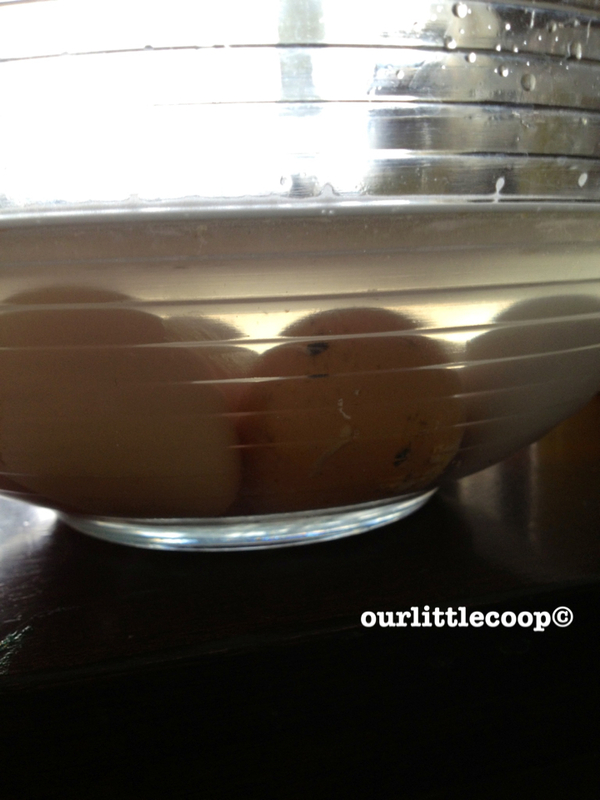 Carefully agitate the solution for about 10 seconds by moving the eggs around and let sit for 10-15 minutes. The all natural cleanser seems to dissolve the caked on crud off of the eggs. From there you may simply rinse and store in the refrigerator. If you want your eggs looking their best proceed to the next step. 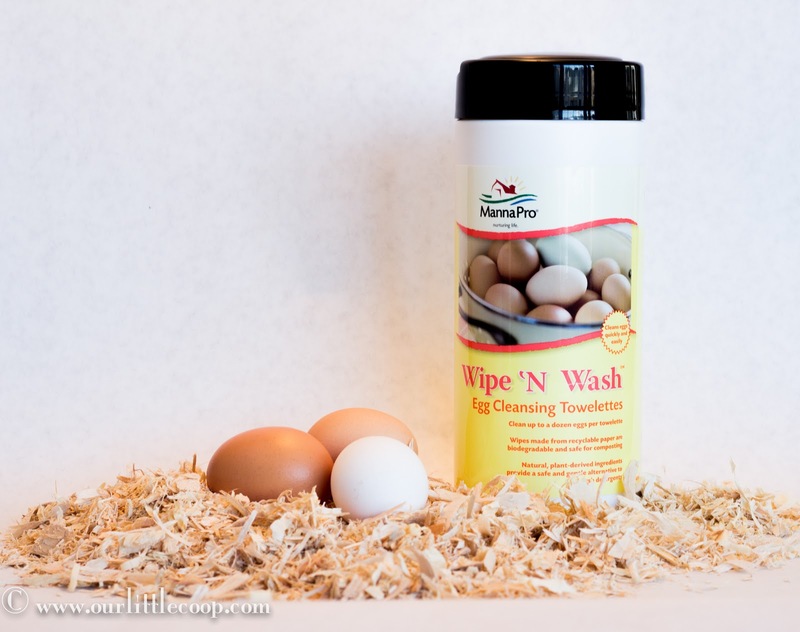 The Wipe 'N Wash egg wipes can be used by themselves quickly and conveniently. One towel can clean a dozen eggs but I have been able to clean up to 2 dozen before discarding. These wipes are made with recycled paper and a natural blend of plant-derived cleaners, and as stated on their package, reveals the natural beauty of your eggs. I usually wash anywhere between 3-4 dozen eggs at a time in the all natural cleanser and follow up by gently scrubbing with these wipes. Our regular customers are alway so amazed at just how clean and beautiful our eggs always look with minimal effort on our part. But the looks are not all that is important…. Beautiful eggs start on the inside. Thanks again to Manna Pro and their all natural Omega Egg Maker supplement, you can be sure you are providing your girls with a rich source of Omega-3 fatty acids and all the vitamins and minerals they will need to stay healthy and produce very healthy and delicious eggs. As I stated, this is a supplement and should be used as one. The directions are pretty straight forward for either mixing directly into the layer feed or using as a top dressing. I accomplish the later by sprinkling about 4 tablespoons over the top of their feed. This way freshness can be almost guaranteed by keeping the remanded on the Egg Maker sealed in the original Manna Pro bag. So it seems that we can all agree that walking outside into your back yard, reaching up grabbing an apple, and without hesitation taking a huge bite out of the side of it without a wash or a rinse is safe. Plucking a few raspberries off of the bush on the side of your house and eating them as you run out to grab the mail is alright as well. And of course the basil in your herb garden just so happens to be the perfect garnish for tonights salad and no, it doesn't really need to be washed. I am the first to admit that when something comes from my own backyard, something I have grown or raised with my own two hands, I am rarely thinking about contamination, dirt or germs. But when buying fresh produce from the grocery store I immediately begin to wonder if the item I am about to buy and eventually ingest is going to be a part of the next major "recall." While some may get a good laugh for me thinking this way and say that the chances are slim, food contamination is real and the effects can be devastating. 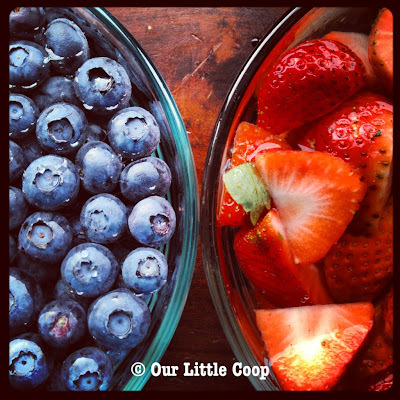 So how can we make sure that the fresh produce that we bring into our home is safer and cleaner? A food scientist at Virginia Polytechnic Institute and State University in Blacksburg by the name of Susan Somner developed an environmentally safe method, more effective than the standard method utilizing chlorinated bleach, in order to decontaminate beef carcasses. This method lead her to study a more difficult challenge which was to remove dangerous microbes such as E. coli bacteria, Salmonella and Shigella from fresh produce. We have all been taught that proper food handling and cooking meat to temp is crucial in order to prevent the spread and ingestion of these harmful microbes, but when they come in contact with raw fruits and vegetables, they can not simply be washed away or rubbed off. Sumner contaminated raw fruits and vegetables with E. coli, salmonella, and shigella and sprayed the produce with vinegar, hydrogen peroxide and then both. In her findings, the produce sprayed with hydrogen peroxide was 100xs more effective as vinegar but when used together killed 10xs more bacteria than when hydrogen peroxide was used alone. Sumner explains, "If the acetic acid got rid of 100 organisms, the hydrogen peroxide would get rid of 10,000 and the two together would get rid of 100,000." Sumner also adds "What I really liked about this treatment is that every (microbe) that drips off is killed." Implementing this method in your own home is easy, it is safe, it is natural and it is environmentally friendly. 1 bottle of 3% hydrogen peroxide found in your pharmacy. Enjoy! I know I will knowing my produce is a little safer. Peters, D., S.S. Sumner, et al. 1996. Control of pathogenic bacteria on fresh produce, a paper (abstract #168) presented in Seattle on July 2 at the 83rd annual meeting of International Association of Milk, Food and Environmental Sanitarians. Free Sticker From Mother Earth News! Put your free No Farms No Food bumper sticker on your car, tractor, truck or your bulletin board at work. You can even distribute them at your local farmers market or county fair! When you display your No Farms No Food bumper sticker, you're helping raise awareness about the importance of saving America's farmland and keeping family farmers on the land. Get Your Free No Farms No Food Bumper Sticker today! 1 We have been losing more than 1 precious acre every minute. 2 Along with water and air, our fertile farmland is critical to sustaining life. 3 Farming employs nearly 16 million people, more than 9% of the labor force. 4 Well managed farmland provides clean water, air and wildlife habitat. So Our Little Coopers, would you like to hear the good news first or the even better news? I'll start with the good news. 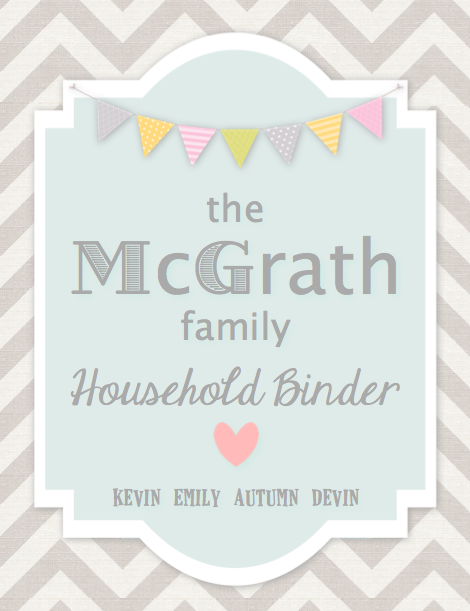 The good news is that I have finished designing and creating most of the printables for the Our Little Coop Household Binder. The even better news? 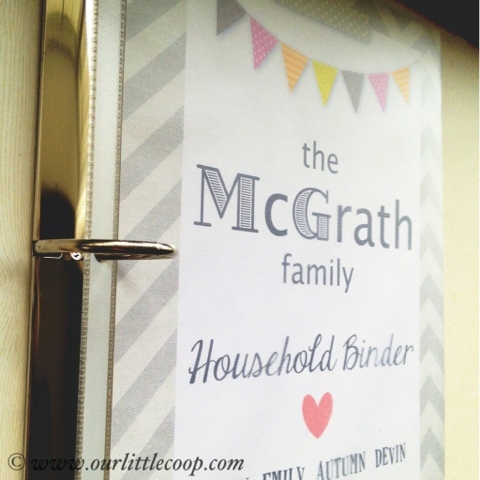 After much thought and consideration, I have decided that instead of selling the Our Little Coop Household Binder printables like I had originally planned, I am going to give them away....for free. Yes, I am going to give them away for free. 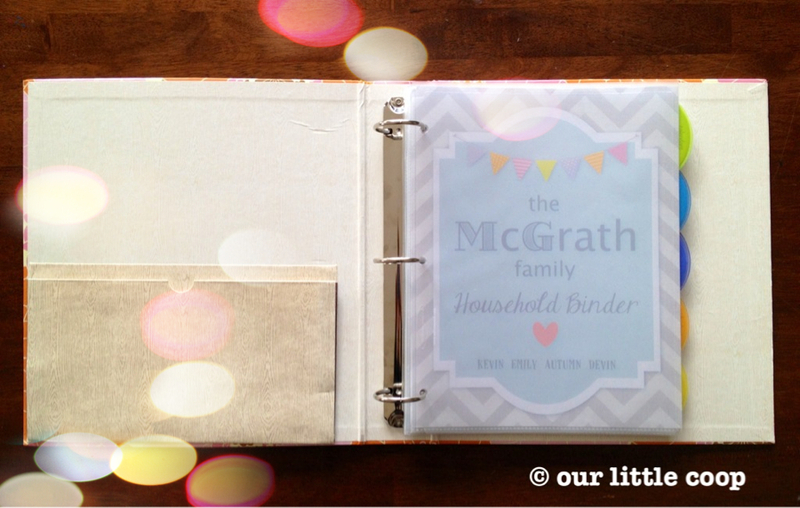 I have spent many, MANY hours creating this binder for my family and while I truly believe that buying these printables would have been worth every single penny, I am fully aware that there are so many families out there right now that might not be able to work them into their budgets. So I would like to offer them to you. To love and to cherish, to have and to hole punch. 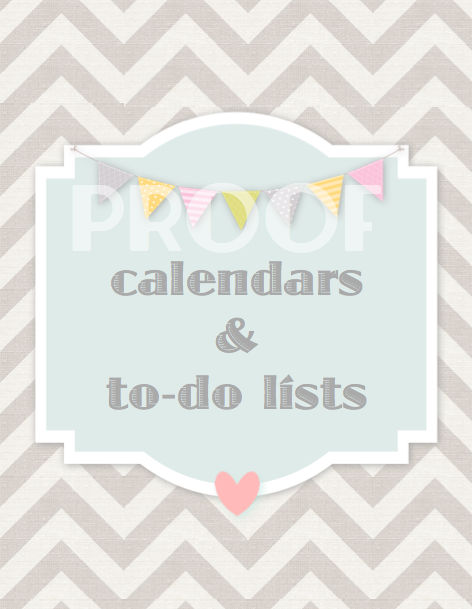 I hope that they are helpful, I hope that they make organizing life a little less stressful, and I hope that someone out there is jumping up and down for joy because they just hit the printable jackpot! 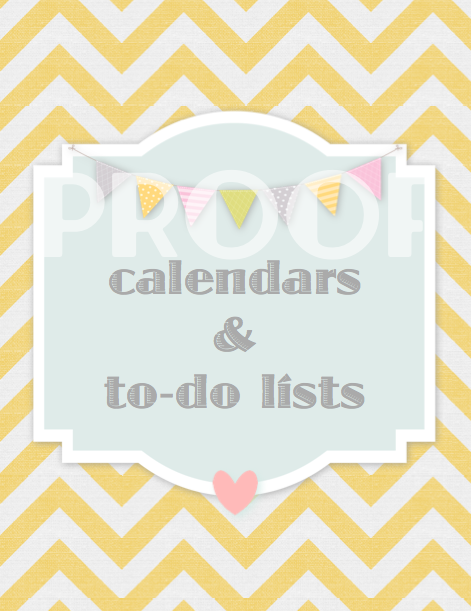 So without further ado, the first of MANY free printable posts. 5,000 Friends and Family Manna Pro Giveaway! Less than a year ago Our Little Coop was not even a figment of our imaginations. Today? 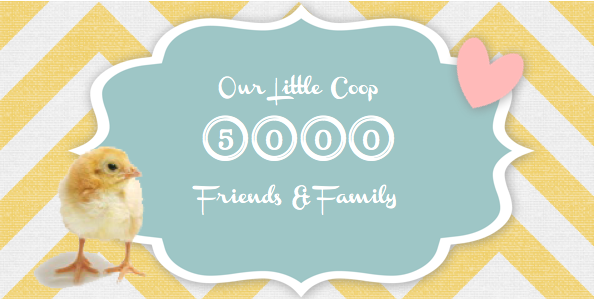 We are blown away by how far Our Little Coop has come and are so very thankful to all of you for allowing us to share (and sometimes annoy) our amazing journey with you! As a token of our appreciation we have some great Manna Pro products up for grabs that we here at Our Little Coop both use and love! Entering is simple and the more you do the more chances to win. Soooo like us on Facebook, follow us on Twitter, sign up for our blog, leave a comment, and PLEASE make sure that you stop by Manna Pro and tell them we sent you. Thanks again and GOOD LUCK! 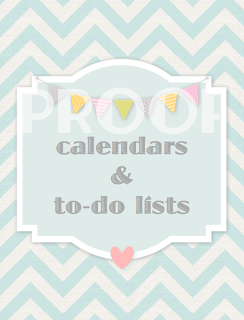 We will be e-mailing you shortly for your shipping information! Okay! Now that we have the basic supplies to begin creating our personalized household binder (three ring binder, sheet protectors, tabbed dividers, hole punch), we can finally start printing and assembling! 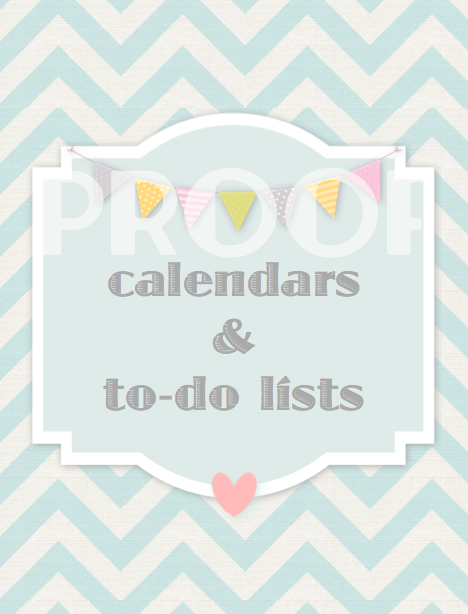 To make things simple, lets start with the coversheet and the divider sheets. The cover sheet can be done in one of two ways. 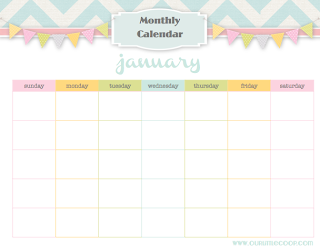 If you bought a binder with a clear view cover, simply print your coversheet and slip it in the front! In my case, I bought a binder that did not have a clear view cover so I slipped my coversheet into a sheet protector and placed it in the very front of my binder. 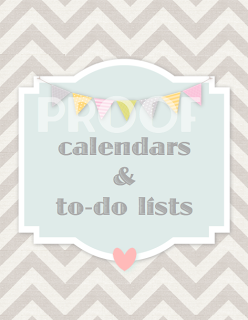 Tip: I would reccommend printing all of your printables on cardstock to ensure durability. So, depending on what kind of dividers you buy, the sheet covers may or may not hang over the edge inhibiting you from seeing your tabs. 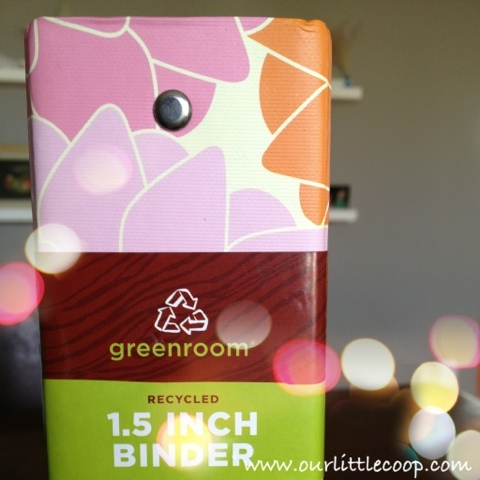 If you happen to buy dividers that are shorter in width there is an easy solution. Take a scissors and cut the hole punch binding off paying careful attention to not cut the "stitching" that holds seals the corner. 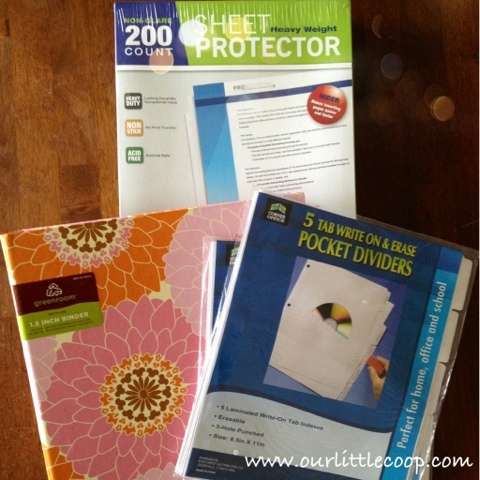 Slip your cover sheet in the sheet cover and create new holes with a hole punch. If you are placing your divider sheets inside of sheet covers and your tabbed dividers are short in width, the same steps taken for the cover sheet may need to be applied here. In this case because the tabbed dividers are already hole punched I found it to be easier to use a handheld hole puncher (don't mind the appearance...I think it's a little old). Line up your divider tab with your cover sheet/divider sheet and individually punch your holes. .22LR ammunition shortage. No end in sight? The once plentiful 22 lr rimfire ammo cartridge. With all of the latest talks of gun control, many suppliers are coming up short handed when it comes to most types of ammunition for sale. Personally I think this is due to both fear as well as the many new gun owners buying up the ammo. But why the 22 Rimfire Cartridge? As most avid shooters know, .22lr Rimfire bullets are very cheap to shoot and can be a lot of fun. Boxes of 500 rounds of ammo could be purchased for a mere $16 - $20.00. CCI is an ammunition manufacturer who is one of many that makes this caliber of ammo, and alone distributes more than 4 million rounds of .22lr a day. So why the ammo shortage? 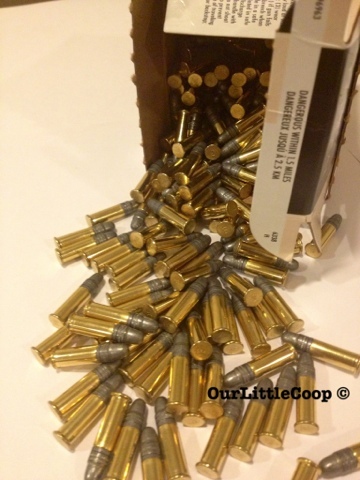 The 22lr ammo has also been popular to varmint and small game hunters. With the abundance of such animals, preppers know this to be an optional harvest if food storage runs dry. This round of ammunition can also, as a last resort, be used as a self defense round. So the next time you see a bare shelf that in months past was plentiful with this little cartridge, know the "guy/ gal next door" may be hoarding thousands of rounds! Update: September 9, 2013 : I have done some research and have found out that the continuing shortage is because ammunition manufacturers have all but suspended pumping our 22 lr ammo in an effort to use that machinery to manufacturer the "more common" (the real money makers) calibers including .223 / 5.56 , .40 cal , and 9mm. Federal Ammunition has began producing "some" 22 lr ammunition. Currently only 5 -6% of their capacity has been this rimfire round and the current prices reflect that. I have seen where folks are paying upwards near $60.00 for a 525 brick. Update: November 11, 2013: Still unable to find any 22 lr ammo in our local stores. I have checked the Walmart, Bass Pro Shop, and Gander Mountain. Absolutely crazy there are not a surplus of these rimfire cartridges by now. FEMA has put together a list of items you "should" have together in your home incase of a disaster. I wanted to share this here as we will be building off of this. This information has been taken directly from their site. Water, food, and clean air are important things to have if an emergency happens. Each family or individual’s kit should be customized to meet specific needs, such as medications and infantformula. It should also be customized to include important family documents. If you live in a cold weather climate, you must think about warmth. It is possible that the power will be out and you will not have heat. Rethink your clothing and bedding supplies to account for growing children and other family changes. One complete change of warm clothing and shoes per person, including:important family documents. Feel free to add to this in the comment section below. Be prepared with generator safety! It is a given. In most cases, the only time you will need to use your generator is when you are tired and the weather is less than desirable. Be safe while using a generator! #1 Make sure when using your generator you leave it running outside your home away from flammable materials and far away from open windows. Generators emit an exhaust similar to that produced from your car and can contain high amounts of carbon monoxide. Remember carbon monoxide is a deadly odorless tasteless gas. #2 Do not overload the generators circuit. Only plug in the recommended amount of extension cords and do not use an excessive amount of splitters. Follow the UL listings on your extension cords as well. If drawing more than the recommended amount of electricity, the cord can quickly become over-heated, melt and possibly start a fire. #3 Store any extra gas away from the generator and any pilot lights or flames. This may seem like common sense but more times than not people leave their extra gas in too close to the running generator making future fill-ups that little bit more convenient. Keep it far off to the side. #4 When the temperature is hot, gasoline begins to evaporate and becomes more volatile. Keep this in mind when the time comes to refill the generators fuel tank. Shutting off the generator and letting it cool first is a very good idea! Following these few simple safety precautions will help you keep the lights on! The Best "Bug Out" or "Get Out" Bag. At a later date, I will be posting a step by step on assembling a "Go Bag" so stay tuned. This article will be an introduction to the topic which will hopefully give you a little bit better understanding if you are a new or even a seasoned prepper. A Go bag is intended to support you for three days incase you are forced to leave your home. Think of its contents in the same manner as you are going hiking for a few days and may not have a home to return to. 72 hours has been chosen in addition to what FEMA recommends because a human being can only live that long without water, and since there are infinite possibilities when it comes to survival, limitations must be made. Limitations are made simply based on functionality, size/ weight, and reasonable duration. #1 That is money better well spent on other preps. #2 If the time comes where you need to bug out, you are making yourself a target to looters and criminals. You want to think cover and concealment when it comes to your gear no matter how good or basic it may be. Do not advertise "I have the best gear in my fancy pack!" or it will quickly become someone else's. Medium ALICE Pack is a great foundation for a "Bug out" or "Go Bag". Medium ALICE Pack outfitted with frame and straps for easy carry. For that reason, I recommend the Medium Alice pack. It can be found very cheap ($30.00) online or in military surplus stores. 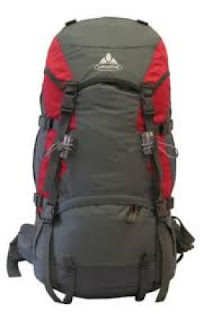 It has been made from heavy duty materials meant to stand the tests of time, are very comfortable to carry when fitted onto an Alice pack frame, and I have personally had several years experience outfitting and carrying one. It just works. Weight is simply not a problem with this pack as it may be for some with the "Mountain" or Large Alice pack, and it is spacious enough to organize and conceal all of your gear. 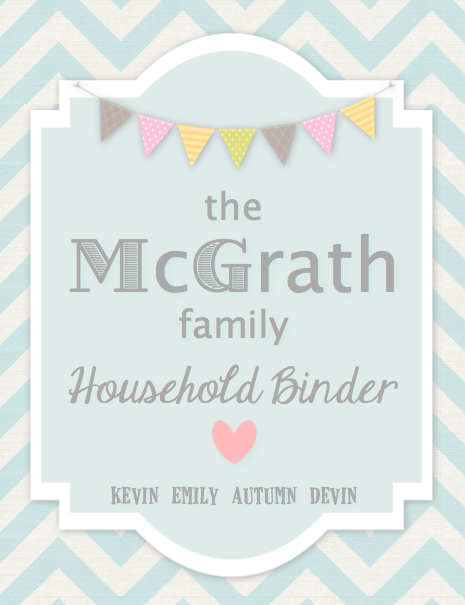 I have to admit that over the past few days I have been mildly obsessed with starting a "Household Binder" for our family. Recently life has felt a little hectic and I had finally heard myself say "we need to get more organized"one too many times, so I took to Pinterest to try and find some great ideas on how to become a little more organized. 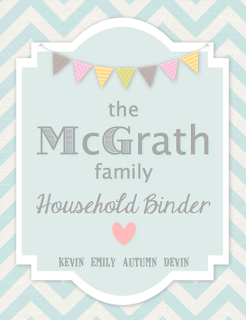 During my search, I stumbled across some beautiful Household Binders and was smitten the instant I laid eyes upon them. 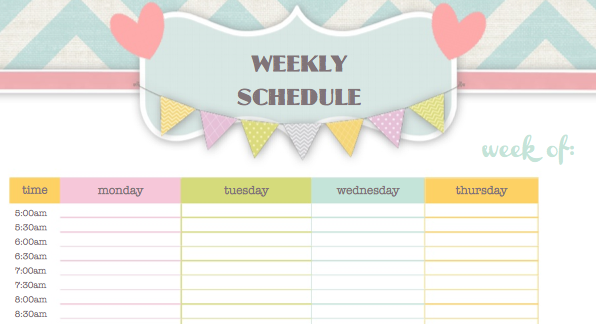 With guidance from The Flylady, I can vaguely remember throwing together a "Control Journal" in the midst of the chaos that occurred after the birth of my son. I enjoyed the idea of the journal, but truth be told I NEVER used it. For those of you who are not familiar with the Flylady, both she and her ideas are really wonderful and if you're just starting out and feeling overwhelmed by clutter, mess, and disorganization, I would highly recommend seeking her out and reading some of the great information that she has to offer on her website. 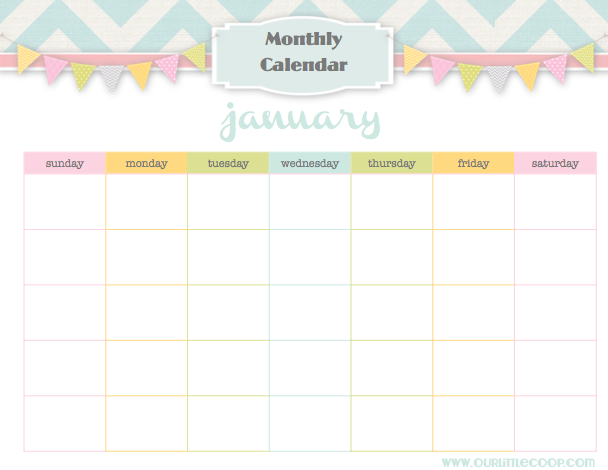 The Flylady control journal for me personally was a great starting point, but I really need something that is tailored more to my households needs. The one thing I will take with me from Flylady and incorporate into My Household Binder is her Zone Cleaning which I'll talk more about later. As always, this is going to be a learning experience and a work in progress. I am here to share with you and hopefully inspire some to jump on board and create one with me! Who's in!? 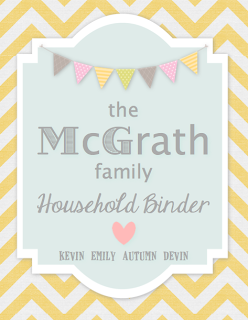 Here is the cover page that I made for my Family Binder. How CUTE is it!? I printed it on to card stock paper, slipped it into a page protector and just officially added the first page into my Household Binder!